New Delhi in the mid-1950s forms Raana Haider’s first recollection of India. She accompanied her diplomat father on his posting to New Delhi. 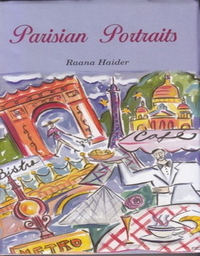 Some fifty years later, she was once again living in New Delhi – this time accompanying her diplomat husband. India: Beyond the Taj and the Raj is the account of the author’s travel across the complex tapestry that is India – underlined with historical and literary narratives by generations of writers on India. Vestiges of the Mughal legacy crowned by the Taj Mahal are relived, as are remnants of the Raj. She explores twenty-eight cities and sites – from Agra to Udaipur. While well-frequented destinations are visited: Bombay, Calcutta, Jaipur and Goa; she also follows the trail to less targeted corners of India – Aligarh, Kashmir, Mamallapuram and Somnathpur. Savouring the lingering legacies of bungalows, clubs, hotels, libraries, mansions, palaces and temples, Raana Haider also dips into India’s diverse culinary heritage, delves into traditional crafts and its fusion into contemporary fashion and furnishings and relishes encounters with literary masters – Ruskin Bond, William Dalrymple, Salman Rushdie and Khushwant Singh. 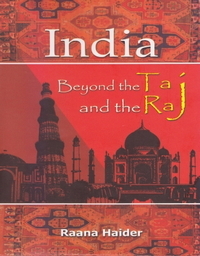 Travellers to India will soon dicover that India: Beyond Taj and the Raj is the compendium to take the place of an informed co-traveller. This book crowns all earlier published recollections of India penned by a non-Indian writer.